Agriculture is facing unprecedented change. Brexit, restrictions on chemical usage, and accelerating scientific innovation all make for uncertain times. However, with uncertainty often comes opportunity, so how can farmers prepare for both the worst and best scenarios? To help navigate the maze, the Cereals Event has organised a highly topical Arable Conference in association with De Lacy Executive. 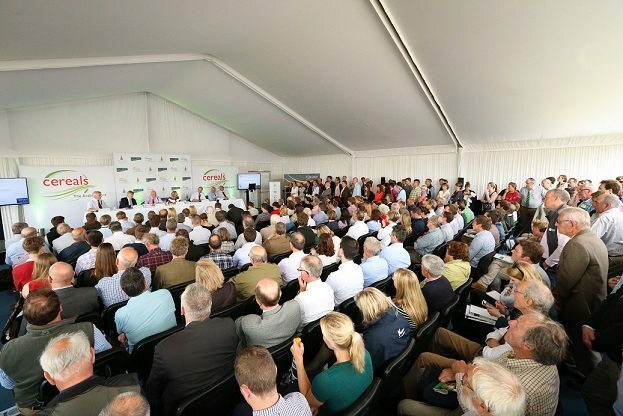 Bringing together industry-leading farmers, policymakers, environmentalists and scientists the Arable Marquee at Cereals (14-15 June) will be a hot spot for information. Aimed at sharing the latest agricultural research and both sides of difficult arguments, visitors will be able to draw on valuable hints and tips through a series of debates, panel sessions and seminars. As an insight, here are just some of the speakers and topics that will be covered over the two days. Kicking off proceedings on the Wednesday is a panel session on Brexit, looking at what might be in store as 2020 looms closer. Speakers are set to include the Secretary of State and NFU president Meurig Raymond as well as David Caffall, Chief Executive of the Agricultural Industries Confederation and AHDB Chairman, Peter Kendall. A later panel debate will consider how to Brexit-proof arable businesses. Sponsored by the Oxford Farming Conference, Nick Mole (Pesticide Action Network) and Steven Jacobs (Organic Farmers and Growers innovation director) is set to take on Guy Smith, NFU Vice President and Sean Sparling, AICC Chairman in a lively debate on the pre-harvest use of glyphosate. Technology and farm management information have always played a crucial role in modern farming, but are we really only scraping the surface, what does Evidence Based Production mean and what will be the benefits as we enter a post Brexit era of Precision Agriculture. To challenge and debate we have Graham Potter, Yorkshire arable farmer, Alistair Knott, Precision Agriculture Development Director, Proagrica, Simon Parrington, Managing Director SOYL and Richard Green from the National Centre of Precision Farming at Harper Adams, all chaired by Farmers Weekly editor Karl Schneider. This technical seminar will look at one of the hottest topics in arable production at the moment – glyphosate. As concern grows for the future of glyphosate and its role within British agriculture, Liz Bowles Head of Farming at the Soil Association and agricultural contractor, James Alexander, will be discussing how farmers can manage without it. An earlier session will also debate whether pre-harvest use of glyphosate should be banned. Livestock and arable production have become increasingly specialised and detached in recent years. However, many farmers are now returning livestock to the enterprise mix, with benefits including organic manure, spreading labour and diluting market risk. In this technical seminar, the National Sheep Association and Hertfordshire farmer Robert Law will consider whether arable farming is sustainable in the longer term without a livestock enterprise. Leaving the EU provides the opportunity to shape a new UK land use policy, with trees (and woods) at its core, embracing environmental as well as sustainable food production. David Rose of Home Farm in Screveton created a silvo-arable scheme compromising rows of apple trees within his arable rotation in a bid to nourish his soil, improve crop yield, attract pollinators, encourage local wildlife and create an additional source of produce. David will be sharing his experiences of agroforestry and taking questions, alongside Woodland Trust Director of Woodland Creation John Tucker. Thursday’s session will kick off with a discussion sponsored by the Oxford Farming Conference, hosting a variety of expert panellists including Bill Clark (NIAB), Charlie Baxter (Syngenta) and Professor Mike Bevan (John Innes Centre). Crop breeders continue to push the boundaries of yield, disease resistance and nutritional quality – so what does this mean for UK and global agriculture? From increasing yields to lowering inputs, intercropping holds a variety of benefits. Chaired by Clive Bailye (The Farming Forum), De Lacy Executive, agriculture’s recruitment specialists will be looking at whether intercropping is the future of arable farming and with organic producer, John Pawsey confirmed as a speaker, visitors are set for thought provoking discussion. This technical seminar will see Yara debate various methods of reducing costs as well as looking at crop nutrition and yield. Nobody wants to waste fertiliser and throw money down the drain, but with margins under constant pressure it’s vital to maximise crop yield – so where does the balance lie? Tickets are now on sale via the website www.cerealsevent.co.uk/tickets and visitors can use the promo code CEREALS17TOS to save over 15% on tickets.